Artificial Intelligence (AI) has begun to take over the world of ecommerce. This growth hints at the impending need for retailers to rely on ecommerce chatbot as a part of their customer service strategy. Let’s dig a little deeper? Artificial intelligence is not only restricted to futuristic movies or incredible devices. It can also be used to improve your customer’s relationship with your store. The chatbots market is expected to grow from USD 703.3 million in 2016 to USD 3,172 million by the year of 2021, according to a research conducted by MarketsandMarkets. AI bots are evolving rapidly, making it easier for businesses to collect data, increase sales, provide real-time customer support, and deliver a meaningful user experience. Chatbots in the ecommerce industry optimizes customer interactions across various touchpoints that influence purchase decisions. Moreover, by simulating conversations with humans, chatbots are simplifying the way ecommerce businesses operate. Why should you use Chatbots in your ecommerce business? Powered by technological advances like predictive analytics and AI, chatbots have delivered a paradigm shift in the retail industry. By focusing on conversational commerce and delivering instant, hassle-free conversations, messenger chatbots help businesses to capture customers’ attention and improve their experience. Here are some of the reasons why ecommerce shopping chatbots are necessary for ecommerce companies. Chatbots are easy to install and use. They can work for hours without human supervision. Implementing them across your business communication strategy will save time and human efforts, while your resources can focus on other productive and high priority tasks. Having said that, the use of chatbots in ecommerce industry results in reducing the number of customer service agents, which leads to a considerable saving in human capital investments. Undoubtedly, ecommerce stores that utilize bots to promote their products across the target audience can turn a significant portion of these prospects into customers and even regulars in the long run. Perhaps unsurprisingly, intelligent bots not only solve the customers’ queries but can also up-sell and cross-sell. For example, a chatbot on your website can ask your prospective customer: “Hi! Is there anything we can help you with?” or “What are you looking for today?”, and then provide them with URLs that will redirect the users to their preferred product choices. By and large, customers who shop online seek real-time responses to their queries. Leaving them unattended or holding them off until you respond to the other customers could get frustrating for many. As they say, a chatbot never sleeps. It is always online. Retailers using chatbots can rest assured that their customers are getting the round-the-clock support they need, 24/7, 365 days a year. Moving on from the slow communication channel that took several minutes and even hours to respond is something every ecommerce business needs these days. Meanwhile, that’s the highest selling point where chatbots help ecommerce retailers by modernizing communication with speed, accuracy and round the clock availability. How to apply chatbots to your ecommerce website? Define the scope of your chatbot project by outlining its objectives. Decide about the purpose it will serve for your business and for your customers. Whether you want your bot to generate sales, answer routine customer complaints, build a CRM channel, or perform any other related task, you should specify the same to your programmers well in advance. Start by figuring out what is it that can benefit your ecommerce business. Then find out ways to connect these objectives within one application, if possible. Doing this especially becomes important if you have a tight budget constraint. Nevertheless, a good estimate of the development cost, time to launch the chatbot, resources needed, etc. is the most mandatory step to begin with. With chatbots, ecommerce retailers can do much more than offering incessant customer support. But, before the process of conversational robots development begins, it is important to gather relevant information to ensure a smooth design and development process. Such information includes product knowledge, customer data, conversation flow, and workforce needed to make the chatbot project a grand success. Besides collecting the necessary information, it is also important to brainstorm bot features and attributes. From conversation tree to keyword response and databases, mapping out all the key elements of a successful bot creation is a must for every ecommerce business. Build the chatbot around customer experience. Add a personality to the chatbot that takes away the robotic feel and adds a human touch to conversations, leading to a great customer experience altogether. To facilitate comprehension by the users, the language of your bot should be simple, with no or limited use of any technical jargon. Also, avoid the use of gender-specific pronouns that might look a bit offensive. You can add emoji, graphics, etc. to make your chatbot interesting. Before you finally launch the chatbot, ensure that it is adaptable and flexible to update and upgrade to technological advances. Going live with your chatbot is a crucial phase in the development process. Do not forget to test your bot thoroughly before the final launch. You can roll out the bot initially to a specific group of people, note their responses and learn about the user expectations from the bot. Beef up your library of responses and add more if needed. Remember that bugs and UX issues may interfere with your bot before and even after it goes live. You might need a few iterations to get a successfully functioning bot. But then again, changes will be vital. Giving a conversational user experience is no easy feat. Your bot might get stuck at times, and you may need future iterations as well. Don’t let the fact unnerve you. AI-powered retail is here. And, all that you can do for your ecommerce business is to make the most of it. From customer service to marketing, chatbots can do a lot for retailers. Let’s take a quick look at some of the best bot builders and tools you will need to boost your retail business. Chatfuel: A great tool for non-skilled developers, Chatfuel helps the users to create a Facebook bot without coding. Dialogflow: Dialogflow, earlier known as API.AI, is a platform that lets you build text and voice-based conversational experiences that are powered by AI. ChattyPeople: Another AI-powered enterprise platform, ChattyPeople helps enterprises to create, test, deploy, measure and manage their bots with convenience. Facebook Messenger Platform: You can build a bot with Facebook Messenger Platform that lets you increase brand awareness, acquire customers, make transactions, and provide personalized support to your customers. Botsify: With features like human takeover, conversation forms, chatbot for website, and WP as well as Shopify integration, Botsify is one such tool that has taken AI to another level. When a chatbot helps your customers to take care of their makeup needs, they are bound to stick to your brand. That’s what Sephora understands and delivers. Its chatbot on Kik enables users to browse makeup products as per their beauty needs and also provides them personalized beauty tips. In addition to the Kik chatbot, Sephora has very well captured the essence of AI with another chatbot called the Sephora Virtual Artist on Facebook that lets customers try makeup virtually. 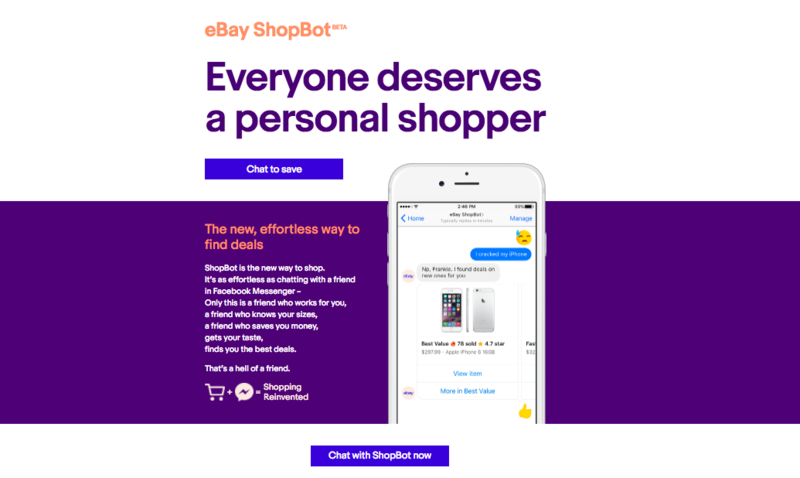 eBay’s ShopBot is one of the best chatbot use cases for retail. This virtual personal shopping assistant helps customers to find the products that they want, adhering to their specific requirements. This chatbot is the perfect example of how ecommerce websites can transform the way they sell products and drive more sales. 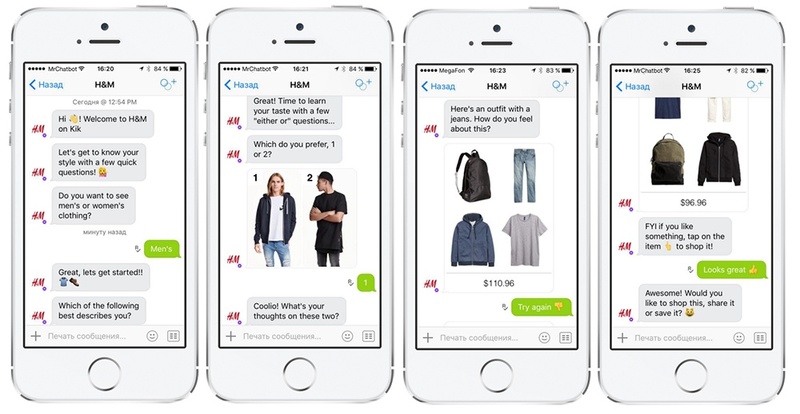 The renowned clothing brand H&M also works with a bot for the Kik messaging app. Just like other retailers, this bot also enables users to buy products based on personalized recommendations. The users can shop according to their style and create a profile that enables them to manage their shopping experience at H&M. 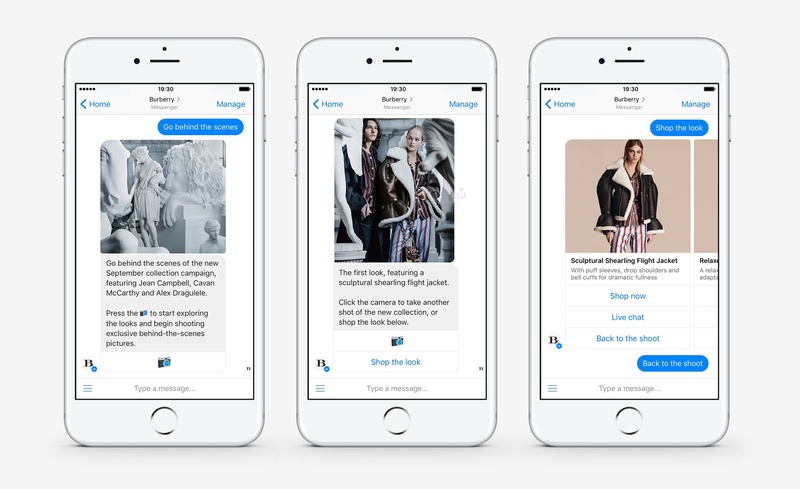 A luxury fashion brand, Burberry may have a presence that dates back to over 160 years, but it successfully embraces new technologies like chatbot to connect with the luxury seekers of today. Its bot for Messenger helps the users to pre-order pieces, view live streaming of their runway shows, browse the latest collections and do a lot more. 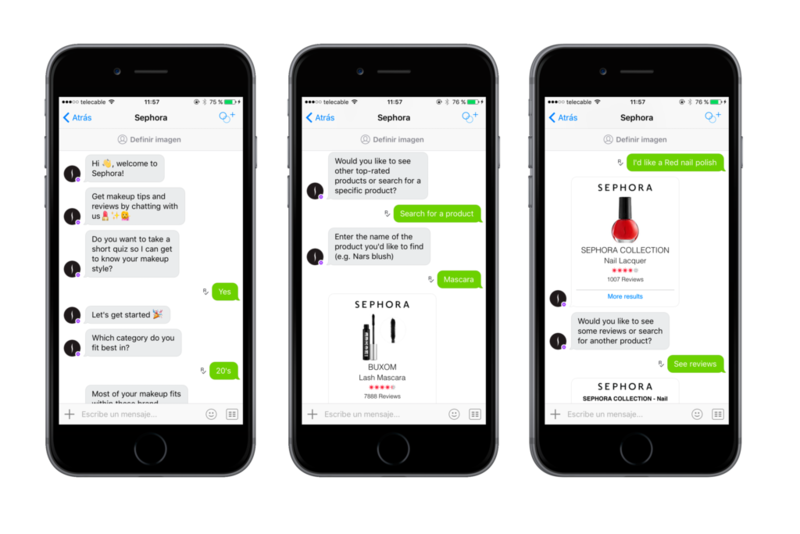 Estée Lauder is our final entry to some of the retail chatbot examples that have increased their customer reach and sales with the help of AI. From giving the option to browse products, shop them and even order gifts, the simple to operate chatbot from Estée Lauder surely adds value to the brand’s business – all thanks to augmented reality. I hope you feel encouraged to implement chatbots into your online store. Keep reading our blog for more solutions to your ecommerce.